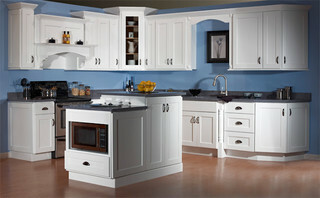 Choosing your kitchen cabinets and appliances requires a great deal of research and rumination. Finding pieces that go well together and colors that fit the rest of your home is important. Add in the fact that the kitchen is a major focal point in most homes, either simply for food prep or also for entertaining, and that means putting together the right aesthetic is key. 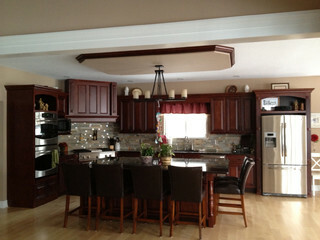 Furniture that complements your kitchen cabinets and overall theme can be chosen in a variety of ways. We take a look at the kind of furniture you can pair with three of our attractive, unique ready to assemble kitchen cabinet designs. 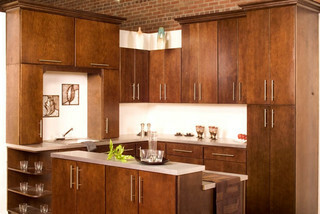 Choosing the wood finish on your kitchen cabinets is a big decision. The wood finish creates a huge influence on the room and you want to be happy with a wood species you’ll be seeing a great deal of for a long time. One important point is that you don’t need to have an exact match on the wood of your cabinets and the wood or coloring of your furniture. In most cases, you can start by matching the undertones to avoid having too much of a monochromatic look. If the kitchen cabinets contain a hint of red undertones, light coloring, or a richer color, pull from that for choosing your chairs, tables, and other kitchen or dining room furniture. Choose a dominant or aesthetic color from your kitchen to highlight with your furniture. For example, if you have black countertops and appliances in your kitchen, choose furniture with a black or dark color to complement it. Black or dark grey top for a dining room table as well as chairs will look great with your kitchen. Matching your appliances and kitchen cabinet accents with the rest of the furniture in the room allows the small details to pop. Instead of streamlining the look, go for something different by contrasting the colors in the room. When it comes to furniture selection, this mostly means choosing between lighter and darker coloring. However, if you’re feeling extremely creative and desire more color, use the color wheel when choosing furniture. For example, dark blues contrast with orange or rust colors, while olive and greens contrast with maroon and red. Otherwise, contrast bright white cabinets with dark, richly colored or wood for the tables, chairs, and other furniture pieces in your kitchen. Furniture doesn’t need to match to look great in your home, and whatever road you go down you’ll create a unique theme. As long as the styling pleases you and your family, you’ve made the right choice.